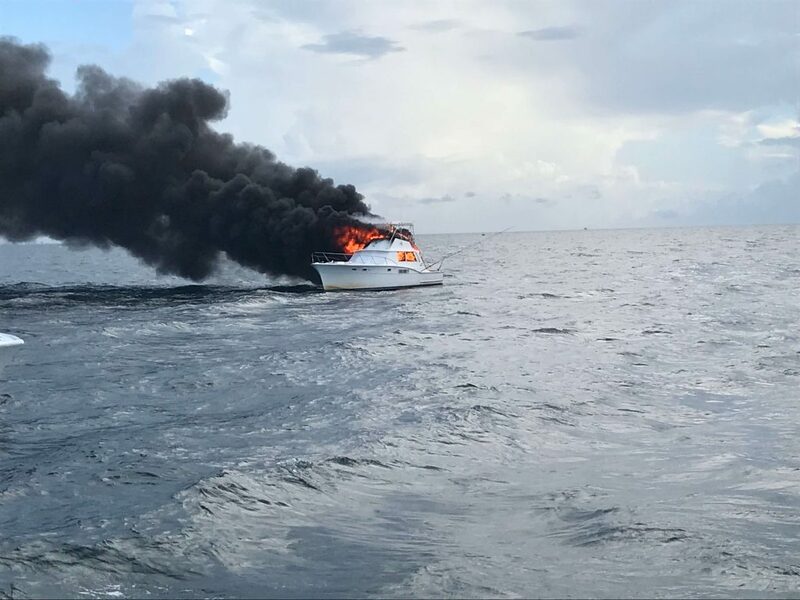 Our captain and crew will never forget the day when we pulled the passengers of a charter boat off their burning vessel. Our boat the Lady Pamela 2 was out fishing just like any other normal day. The seas were about 2 to 4 feet with about 10-15 knots of wind. There were a few other boats out this morning and we were all working about a 2 mile radius of fishing grounds in about 100 to 200 feet looking for kingfish, mahi, tuna, bonita and more. While trolling the edge, we notice another charter boat with a fair amount of black smoke coming from the cockpit. In no time, it was obvious that the boat was on fire and escalating quick! Our Captain, Gino yelled “We gotta get those people off that boat NOW!”. Our mate Sean starting reeling in the lines, but there wasn’t enough time to get them all in, so he cut one of the lines in hot pursuit. As we pulled up to the charter boat “The New Latitude”, owned by another charter company in Fort Lauderdale was in serious trouble. We knew we had to get those people off the boat quick as it was engulfed in flames and could could down at any moment. We also noticed no one was wearing life jackets. As professional charter boat captains, it is our duty to help out fellow boaters as well as fisherman no matter the situation. And even more importantly it is our duty as fellow men to help our brothers out. There was no question, we were going to do whatever it took to get those people off that boat while keeping our crew safe. There are a few way to handle a rescue like this. One may argue that having the crew put on lifejackets and get in the water is ideal for picking up the passengers. However, we noticed none of them had lifejackets on board and also was said there was a pregnant woman on board at the time. Without time to think, we knew we had to get the boat close enough so that they could hop on board bow to bow. If the fire was raging in the cockpit, then we would of preferred coming up from the transom, but that was not an option. Now when doing a passenger transfer in any kind of seas you risk damaging your boat severely. However, we would never put our boat first over the rescue of lives. But you do have to think and consider the situation. For example if this was a Gas vessel, you risk the chance of the fire spreading or an explosion. We obviously knew this was diesel so we decided to get as close as we could and get those people off the boat as fast as possible. With 2 to 4 foot seas, the task was no easy feat. The Lady Pamela 2 took on some damage as the boats bows collided from a wave. As one person tried to come over to us, he nearly fell between the two boats, but luckily caught himself. With some tight maneuvers and our mate Sean carefully helping, we got all the passengers including the captain aboard and no one was hurt. It didn’t take long for fire rescue to show up and try to put out there fire, but it was too late. 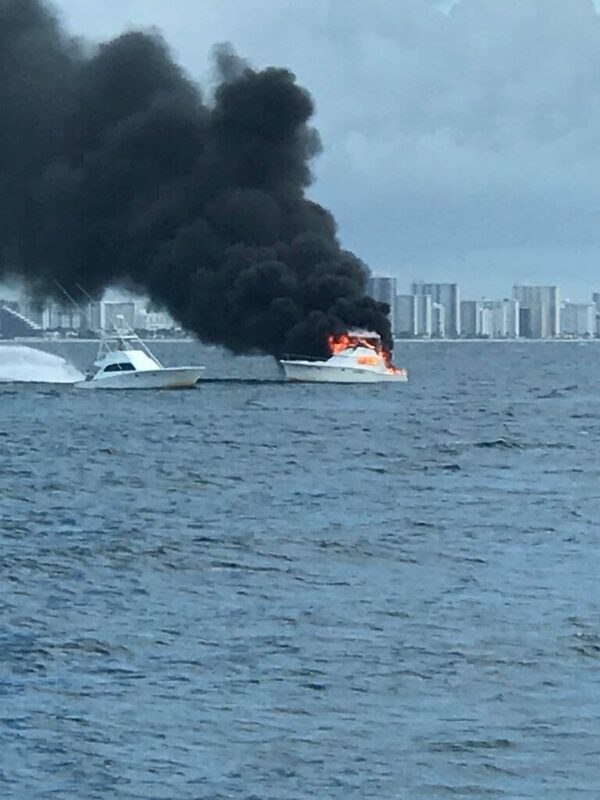 The boat was completely engulfed in flames and eventually sank just off the beach. Back at the marina, just about every local news station in town was calling us. They had their helicopters out and wanted to hear first hand from the crew of the Lady Pamela on how the rescue went. Later on that day, local Channel 4 and 7 did an excellent job covering the story. We don’t consider ourselves hero’s by any means, we were just doing our jobs and what we hope anyone would of done. Overall, I am so happy our captain and crew was out there to save lives at the right time. If we were not out there at the time, I’m not sure what the outcome would have been. It is critical as boaters that we always have a safety plan in place. Before all our charters, we go over what to do in exact situations like this including where you access life jackets immediately. We also have a fire suppression system on every boat in place called the “Fire Boy”. Not only do we have this system, but we check it more than recommended to ensure it is working. And of course all fire extinguishers on the boat are checked more than recommended to ensure they are working as well. I’m not happy that the crew was NOT in life jackets during the rescue. That is the first thing that needs to be done in a case where people might enter the water. It certainly worked out, but we can always learn from each rescue no matter how successful it was. Please comment on our YouTube channel how you think we did and what you would of done different if anything at all.